I really wanted to make an artful quilt to gift to a special crazy Frenchman in my life. I am going to get to see him on Friday, May 9th, so I decided that this past weekend I had better make something happen! I checked in with a few close family friends who know him very well, and while my intuition about the colors he likes was spot on, I wasn’t sure what kind of pattern to use for the quilt top. When I learned that he loves birds, well, it was a pretty simple matter to find a cute (and free!) bird paper piecing pattern online. If you like the block, feel free to use the McCalls Quilting bird block pattern, too! This is only the second time I have ever paper pieced (the first was in Lee’s Shooting Star class at Sewdown Portland – thanks, Lee! ), so I decided to read up on the technique again before blundering along and getting upset. It went really well, though, and I was amazed at how quickly I pulled this quilt top together given that I was doing something pretty out of the ordinary for me. I started looking online for a paper pieced pattern on Friday at 10:45 in the morning and I had the quilt top done by 5:00 that evening! 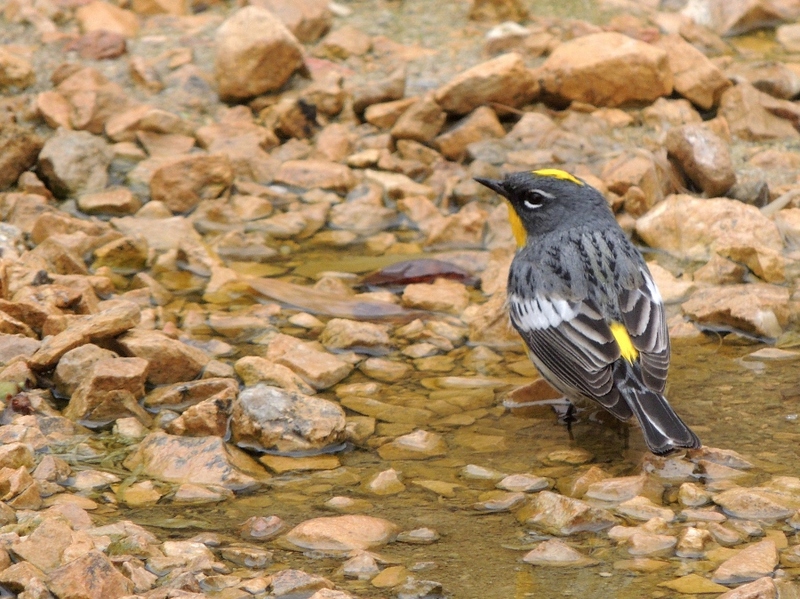 The first bird block I made is loosely based on a Yellow Rumped Warbler, whom I photographed in my backyard a few weeks ago. I quickly made several more blocks, but then I was stumped for a moment. I did not want my birds all facing the same direction, so I puzzled out how to use my printer’s advanced settings to print a mirror image of the pattern. Score! I used fabric and batting from my stash, so the mini quilt is the size that the amount of background fabric I had on hand allowed me to make. 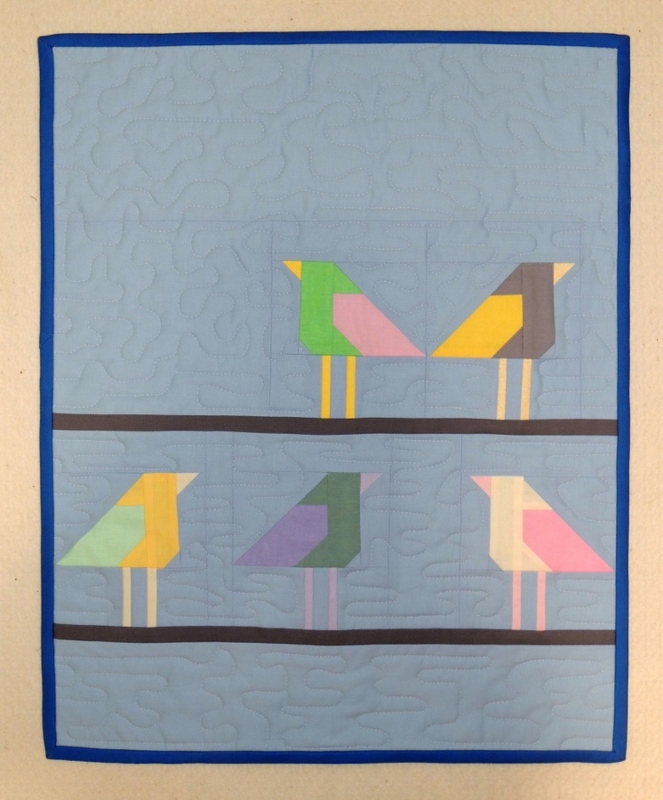 The “Birds on Telephone Wires” mini quilt finished out at 18″ by 22.25″. My photographs below do not show it, but I also made a hanging sleeve for the back of the quilt. For the quilting, I used an all over meandering pattern that started to look like stippling! When I started learning to free motion quilt on my home machine, I really wanted to learn how to stipple. But my stippling looked horrible. Since it did not work for me at the time, I just moved on and tried my hand at a lot of other patterns and never really came back to it. I was pretty excited with how this turned out because it gives me confidence to go practice on stippling a bit more again! Yay! Another awesome feature of this quilt is that it contains my new Quilting Jetgirl logo fabric that I had printed by Spoonflower! I love it! I especially like the way the logo looks with a subtle color shift. The white background logo is probably the one I will be using a lot in the near future. 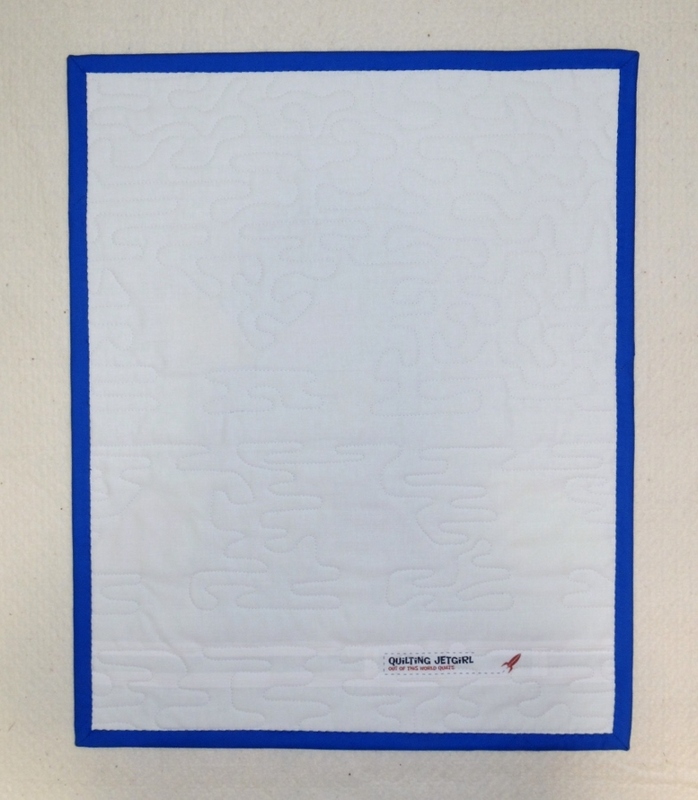 Mini Quilt Backing Detail – Quilting Jetgirl Logo Fabric! I am looking forward to getting to hand deliver this gift later in the week. Fingers crossed that he likes it! I love those little birds! Your quilt turned out great, and your label is perfect! Thanks, the birds ended up being a lot cuter than I expected. Wonderful gift! Your birds look fab! Love the Spoonflower label! You re quite the busy bee!!! Or should I say busy bird? Fabric labels from Spoonflower–that is genius!! Adorable birds, and welcome to the world of paper piecing! I have a feeling you’ll be hooked (at least I was!!). I was in a class a few months ago and the instructor suggested printing labels on fabric and piecing them into the backing. Somehow that stuck with me and the Spoonflower printing worked great for me. This type of design would be great for a child’s room! You might consider making more similar minis in the future! Been catching up on your page this morning… congrats on moving to quilting full time!